Etienne Drian, 'Bouquet tricolore', Gazette du bon ton, 1915. Pochoir print. CSM Archive. 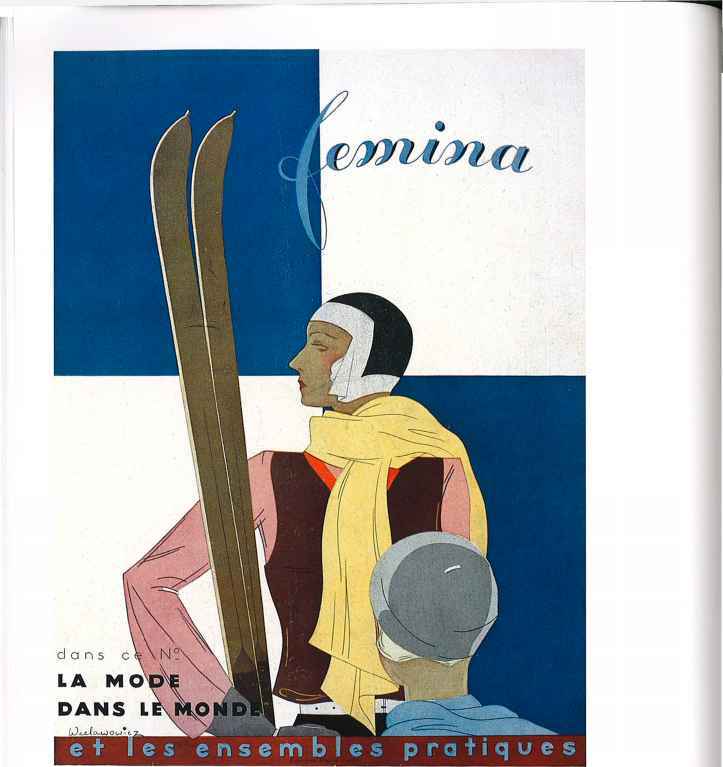 Drian also illustrated for Femina, Les Feuillets d'art and Harper's Bazaar, and for Printemps department store, as well as designing interiors, stage sets and costumes. Anonymous, 'Costumes de Jersey' by Chanel, Les Elégances Parisiennes, July 1916. Private Collection. 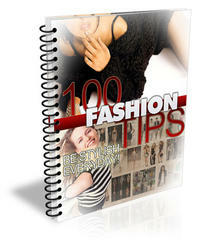 Belted jumper-blouses pulled on over the head and worn over a blouse and skirt typify Chanel's easy-to-wear separates. The centre model is wearing the two-tone shoes that would become a Chanel trademark. 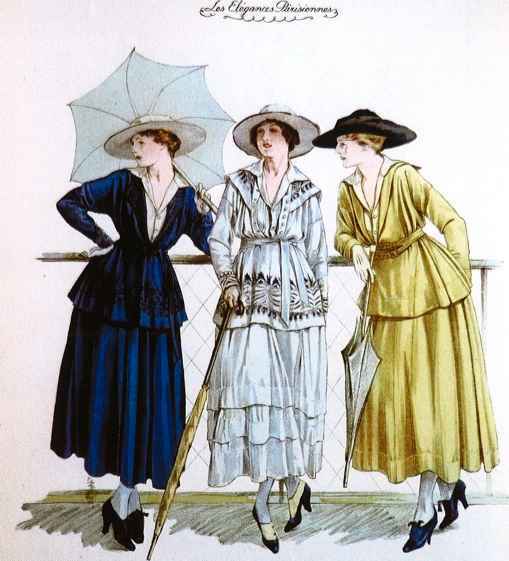 L!HOM (above),'Les Dernières Créations de la Mode', Les Elégances Parisiennes, April 1917. Coloured lithograph. Courtesy The Bridgeman Art Library/Archives Charmet. Chanel claimed that it was the First World War that made her. 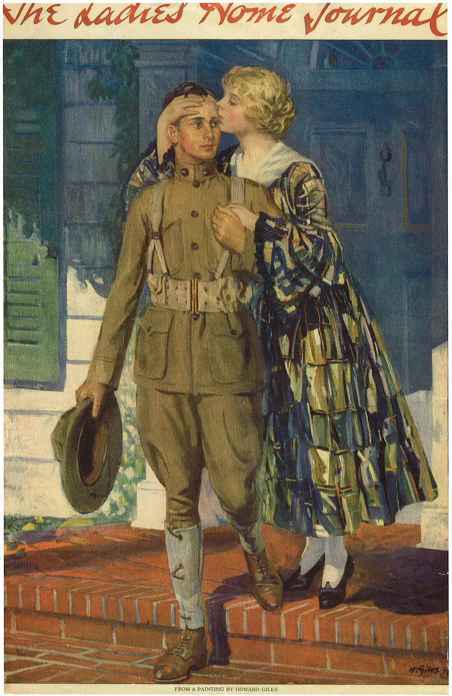 Here one of her models is accompanied by a soldier in uniform, while the other male figure wears formal morning dress. 'Sem' (right), 'Coco Chanel as a Milliner', Le Grand Mode a I'envers, 1919. Coloured lithograph. Courtesy The Bridgeman Art Library/Private Collection/Archives Charmet. 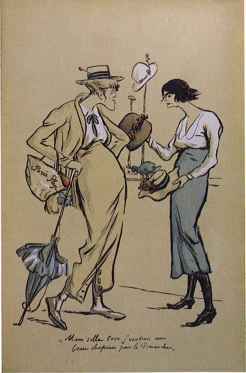 Originally trained as a milliner, Chanel is caricatured here by Sem (Georges Goursat), whose take on fashion was always humorous. Howard Giles, Cover from The Ladies' Home Journal, c. 1917. Courtesy The Advertising Archives. When the USA joined the war in 1917, thousands of 'doughboys' - men belonging to the American Expeditionary Forces - went to France. A fashionably dressed young wife bids goodbye to her husband, who is dressed in khaki uniform with puttees and a field hat. Made in Burberry-woven and proofed cloth, it ensures effective securi ty against any wet that falls or wind that blows. Unlike, coats loaded with rubber, oiled-silk or other airtight fabrics. THE BURBERRY is so airvlight and faultlessly self-ventilating, that it is as comfortable to wear in hot weather as in cold. IVi lt-cl fi* is asjojtMl. as every »arment 5i inrule j itV nu loss li>;m 55 «liifrrcrtl fircs. Complete : Arils to nwasiir« in from 2 In 4 li.'ivs. Illu»tratcd Naval or Military Catalogue« Pojî Free.